Effluent drains never connect to what you think they do. Effluent drains are always connected to storm drains. Storm drains are always connected to effluent drains. Effluent drains always leak where you can’t see them. Effluent drains always leak when you’re not looking. If everything seems to be OK you’re about to experience a one in 300 year flood event. If you had a one in 300 year flood last year you will get another one this year. Storm drains always block when they are needed the most. All your drains will always overflow into a watercourse, upstream of a fishing area that has just been restocked because of a previous pollution incident. Drums are never stored where you think they are. Drums always fracture, leak and fountain where you can’t see them. Drums always leak when you’re not looking. Drums thought to be empty are always full and about to leak. Drums thought to be full are always empty and have leaked. When the contents of a drum that is inside a bund jet out from a fracture under pressure, the fountain will always spurt over the bund wall. Tank contents are often measured by dipsticks. Tank contents are often not measured by dipsticks. Tanks are never big enough for what‘s been delivered. Tanks are often filled remotely, which means the operator is elsewhere with a bacon butty. When a tank is overfilled that’s the day the bund will leak. Tanks always leak 90% of their contents but only 10% can be accounted for, except by the man walking his dog or the owners of the car showroom next door that has just exploded. All bunds have invisible holes. Everyone on site has poor sight. If the bund hasn’t leaked yet then no one has overfilled the tank to test it. Bunds are always positioned over or near storm drains. Bunds are either full of water or won’t hold water at all. Bunds always begin to leak in the early hours of a Saturday morning or Bank holiday. Leaks are never discovered until the early hours of a Sunday morning by someone walking a dog or a Monday morning when the gas boiler ignites in the car showroom next door. When anything leaks, spill kits can’t be found 80% of the time. When spill kits can be found, those attending the scene only know how to use them 20% of the time that they couldn’t be found and none of the time that they could be found. Leaks always reach the surface water drain faster than the emergency spill team can respond 100% of the time. When spill kits can be found, they will be padlocked in a sealed box. Wherever spill kits are kept in a locked container no one will be able to locate the key. Whenever a crowbar is used to open a spill kit, the container will be empty most of the time. When the container does contain a spill kit, the container will also contain water from rain and snow penetration making it a very effective although useless bund. Every month there is a catalogue of prosecutions for water pollution incidents across the country, caused by spillages, overfilling of tanks or drainage and containment failures. Often these incidents are a virtual carbon copy of previous accidents. 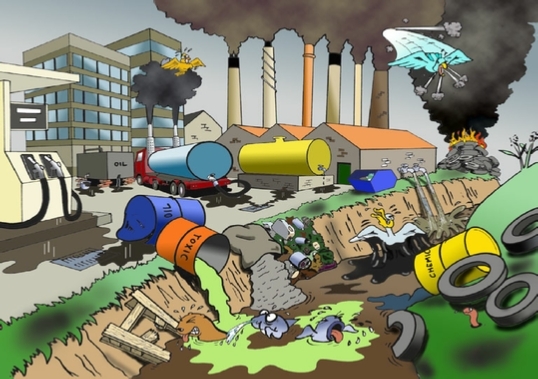 This constant repetition of history has allowed us to derive the following basic laws on the nature of effluent and materials management. If you have never had a pollution incident arising from an incident your site then these laws will seem a little exaggerated. If you have, they will probably strike a chord, a sort of unsettling, jangly, hangover kind of chord. Don’t worry, that’s a normal reaction when you have been responsible for the death of 10,000 fish. It’s something to do with the way humans perceive risk and how they manage it.